When you do leave your villa, the island holds lots of surprises to keep everyone busy. The recreation area is great for adults and kids with 6 tennis courts and an equestrian center. Water lovers will park their Mules amongst the trees at Macaroni beach and enjoy bouncing on the waves all day. We spent an afternoon at Macaroni which is the most popular beach on Mustique. It's a nice size for short walks and believe it or not, they rake it daily to keep the sand beautiful and free of debris from the sea. Snorkeling and scuba diving are popular, but don't expect to see any jet skis here because they are not allowed. The people of Mustique realize that you only have one chance with a small island like theirs, so they make every effort to protect it so that it will be around for many generations to come. The limit on home sites has left the island with a lot of open space where you can find nature trails to explore the flora and fauna. Looking to the future they hope to incorporate more electric cars on the island, even providing charging stations at the beaches and other public places. The Cotton House is another central location for activities on the island. It's located on the water, just a quick drive from the airport. 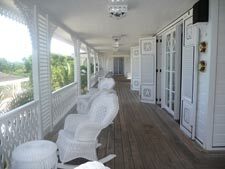 This is the only luxury hotel on the island and it has 19 rooms and suites. Hotel and villa guests are welcome to enjoy treatments at the spa here, maybe a lime and pineapple body scrub or a hot stone massage. The Cotton House is also the spot to be on Tuesday nights for the weekly cocktail party that is open for hotel and villa guests to come and mingle to reconnect or meet new people. There are also weekly movie nights for children and outdoor theatre for adults. It's a great hotel for families or couples, and a great gathering place for all visitors to the island. This trip was my first experience in the Grenadine islands, and what a jewel that area is. Mustique was a terrific surprise for me, as I had very little previous knowledge of this island and what it can offer our clients. It's a very welcoming island with the perfect mix of casual and luxurious. This is where you go to get away from it all, to drift from the everyday into days full of tennis and nights laughing with friends around the pool. This is where you can go back to nature but still fall into a deluxe bed at night. It?s an island where family traditions are built to be shared across many generations. I hope you'll get to explore this tiny paradise very soon, just as I hope to return before too long.